I have done a few posts about the US space program over the last couple of days but when I saw this image pop up yesterday it got me annoyed. it was a very poor attempt at a joke saying that NASA has stopped “doing manned space” or something… I’m still not sure which, if any of that is correct. From the heady days of the start of manned space missions. The time when NASA received almost 4.5% of the federal budget to the lean times – like the one we are in now. The 2012 budget was, under 0.5% of the budget. Using a part of JFK’s speech at Rice in 1962. One of the parts that people don’t really remember. To be sure, all this costs us all a good deal of money. This year’s  space budget is three times what it was in January 1961, and it is greater than the space budget of the previous eight years combined. That budget now stands at $5,400 million a year – a staggering sum, though somewhat less than we pay for cigarettes and cigars every year. Space expenditures will soon rise some more, from 40 cents per person per week to more than 50 cents a week for every man, woman and child in the United Stated, for we have given this program a high national priority – even though I realize that this is in some measure an act of faith and vision, for we do not now know what benefits await us. Just think about trying to get America to believe in space again. The moon but it’ll cost you less than a tall Starbucks coffee a month to fund NASA to Kennedy figure! Would you be willing to give up your coffee to get back to the moon. I’ll be the first one to put money in that tin. space has never been cheap, or safe, but the benefits are massive. Now where was I. Oh yes. 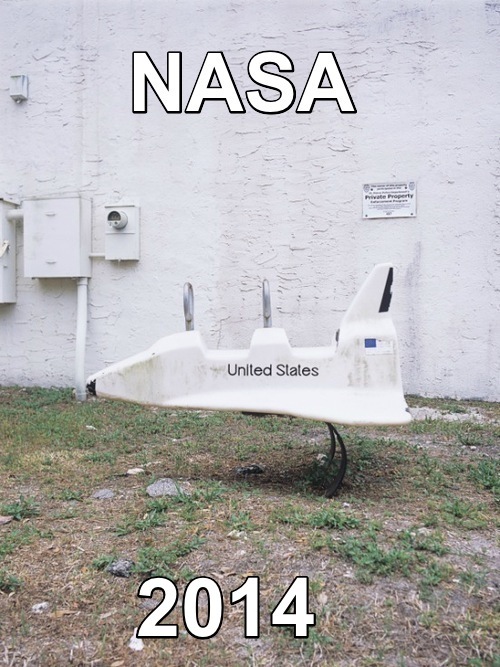 The state of NASA in 2014. Yes, there is no Shuttle and we are years away from any sort of replacement. Her first test flight is planned for later this year. The ISS – the most expensive construction in the history of mankind – is orbiting the earth every 90 minutes.